Simply put, you can use the high tech you already have to consult and service more patients in a more efficient and completely secure manner. It doesn’t change who you are or what you do. The only difference is the method you are using to treat your patient. There isn’t anything you have to change about you, your manner, your staff, or your practice. As fancy as this all sounds, it’s no different than making a phone call or talking with anyone using a video chat program on your smartphone or laptop. We have many videos available to show you and walk your through it and our support team is always standing by to help you if you have any questions. What are the benefits of teledentistry? The benefits to you and your practice are numerous. Keep in mind that teledentistry isn’t something that is designed to replace your practice. It is designed and used as an extension of what you currently do. It can reduce costs to you and your patients. No more having the patient miss work, drive over and spend their valuable time in your waiting room. No more lost production, and therefore income, from no-shows or cancellations. Improve your efficiency and increase your production by being able to see more patients and fill in cancellations in a moment. You’ll have more access to more patients, including those that live in a rural area or are too afraid to come in. You are just a click away. No more wasted time spent in the waiting room. Patients can meet you from the comfort of their own home or office. Gives you a competitive edge against the dentist’s that don’t use it. Greater patient retention. It’s much easier and costs less money to retain a patient than to find a new one. As of 2015, it is estimated to be over 204,000 active dentists in the United States. Yet over 100 million people don’t go to the dentist. Fear and lack of money are two of the main reasons. With video conferencing, you are able to reach people that are too scared to come in. You have a huge opportunity to talk to them, face-to-face, to begin to alleviate their fears and help them to schedule and arrive. It’s impossible to help someone if they won’t talk to you. For a fearful patient, it’s almost impossible to get them to make an appointment, get in the car and drive to you, deal with the time off work (and possibly lost wages), and wait, nervously, in your waiting room. With video conferencing, you can talk with them immediately, answer their question, and let them get to know you. That is half the battle. You’ll have much greater success in turning them into patients and helping to calm their fears. Who’s currently taking advantage of it? Insurers are beginning to pay for this because of the demand from patients. 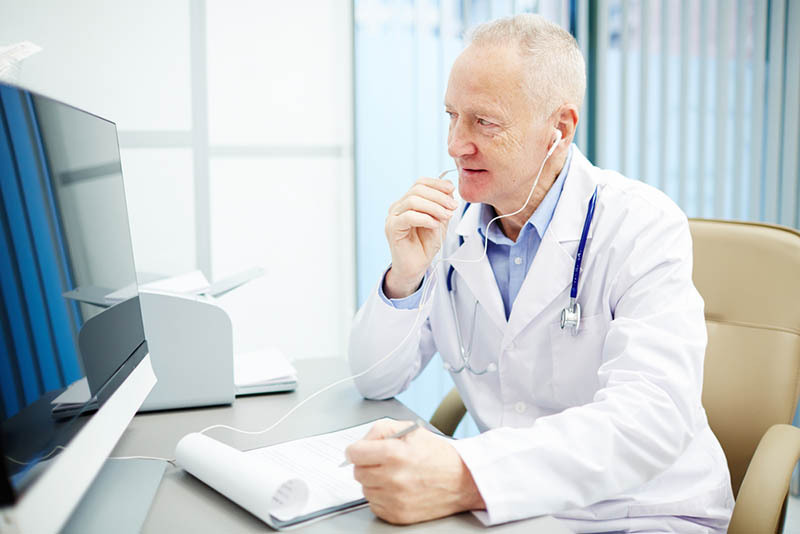 Over 10 million patients have used telemedicine in 2012. That is doubled from three years prior. It has continued to increase each year. It’s not expected to slow down or decrease. The sooner you learn about it and see what it can do for you, the sooner you’ll wonder how you ever lived without it. How is today’s technology making it easier to implement? Teledentistry isn’t as new as you might think. The technology has been around since the 1990’s, but it’s only been recently that we’ve been able to take advantage of the advances of smartphone, tablets and laptops/desktop. We help you improve your access to more patients with a HIPAA compliant application that is easy to use and it’s free for both mobile and desktop. Many video conferencing applications are not HIPAA compliant (Skype, Google Hangouts, etc. ), but we are. We have taken all the work and worry out of it for you and you can use our program without worrying about the security of your patient’s information. You’ll have better communication with your patients and they will appreciate the ease and convenience of the service. It’s as simple as making a phone call. With this app, you’ll be able to text, call, or video conference with your patients immediately. As of January 2015, Medi-Cal covers teledentistry. California is one of the first states to include teledentistry. Currently Oregon, Colorado, Hawaii and West Virginia are also working on similar legislature. 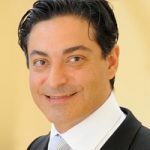 This is a trend that is going to continue as more and more see the advantages to teledentistry and the benefits to both the patient and the dentist. Each provider should be checked, as usual, for coverage. For those that do reimburse, it is usually the same or similar as an office visit. The goal is to extend dentistry services to everyone who might not see a dentist otherwise and to provide all patient’s with the best care possible in the most efficient and secure environment. What qualifications must be met? You must be HIPAA compliant. Denteractive meets all the requirements laid out by HIPPA. 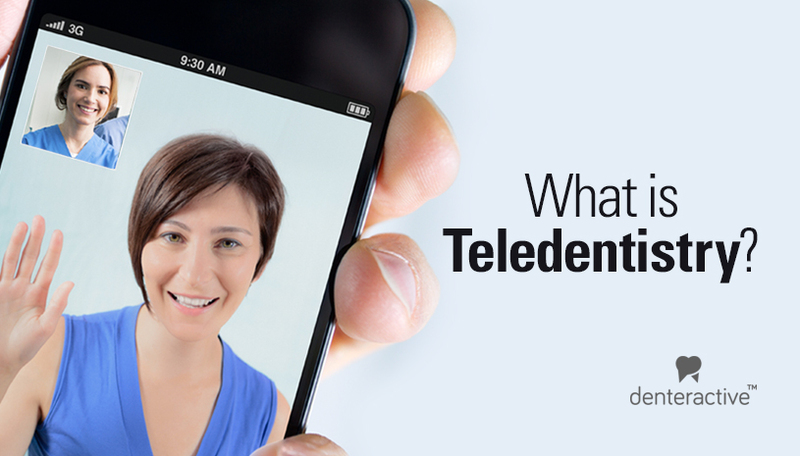 What do patients think of teledentistry? 64% of patients said they would be willing to see a doctor via video and 17 million people said they would change their primary care for a doctor that uses telehealth technology. Of all the consumers surveyed, 88% said they would choose a healthcare professional based on their training, experience, credentials, and the doctor’s online profile. This is the reality of healthcare today. Patients do not want to be randomly assigned to a doctor. They want the doctor they can see. This means your online presence is no longer just a fun or cute thing to do. It is now vital to you, your practice, your staff, and your overall solvency to be in the forefront of teledentistry. 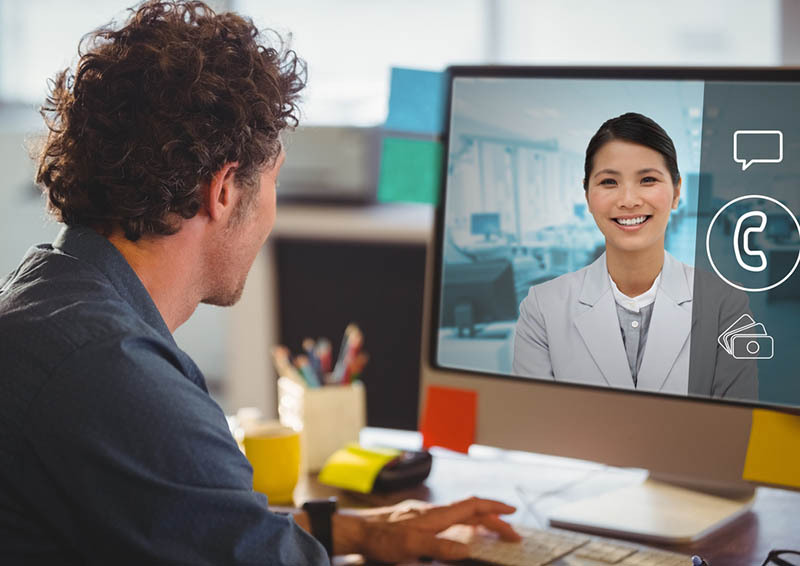 7% of the patients said they would switch their healthcare professional to one that used video conferencing. That 7% translates to 20 million people. That is a lot of new patients that you would have access to simply because of your ability to use teledentistry. 63% of those consumers interviewed have higher confidence in a accurate diagnosis with a video call than a phone call or email alone. We live in a fast pace and hectic world. People want access to information immediately. Most of us use our phones without a second thought. When searching for a dentist, patients expect to acquire the information within seconds. Being available to talk to you with just a touch on their phone will increase your chances immensely of getting them as a new patient and into your chair. To service more patients and increase their retention. To lessen holes in the schedule. To increase efficiency in the practice while lowering your overhead. To not worry about software that isn’t HIPAA compliant. To be easily found by a patient searching online for a dentist. To increase the amount of treatment accepted. To be able to have more consultations with patients. To increase preventive care of patients. What are the simple ways to get started? HIPAA compliant Text/Instant Messaging. Secure. HIPAA compliant Video Conferencing. Secure. HIPAA compliant File Sharing. Secure. Patients ability to request an appointment. Ability to make appointments face-to-face. Simply register here and you’re ready to go. We are available 24/7 to help you and answer any questions you may have. We give you the ability to talk with your patients at any scheduled time. It’s a very unique way to connect with them and gives you more opportunity to educate and help them. You’ll have more consultations and that will give you the chance to monitor their progress, answer questions, find and remove their barriers to accepting treatment, and coax them along as needed. Being accessible is a huge part of why a patient decides on a doctor. Knowing that you are there for them is crucial to them and their feeling of being cared for. Denteractive is made for the dental field only and that’s our only focus. This was made by a dentist and it’s sole purpose is to enhance your practice and increase your education of patients and give them better overall care. We help you build up quality patients and make it easy to find you and connect with you. Patients are looking for dentists online now more than ever. Don’t miss the opportunity of them finding you via our search function and connecting up with you. Our program is free and you are under no obligation. You owe it to yourself and your patients to check it out and see how easy it is to use. You don’t need any specialized training. It’s user-friendly for both you and your patient. Patients are looking for you – let us help them find you.